When I worked orientation the summer after my sophomore year of college, we occasionally had a 5:30 a.m. call time. At the beginning of the summer, those mornings were full of adrenaline, and despite the early hour, we’d show up raucous and ready to go. After a couple weeks of this, the thrill wore off. I drowsily helped myself to the catered coffee service, and that was the first time coffee really hit the spot for me. I was never a caffeine addict, but that morning coffee had an answer for all of my needs. I tell this story because it was the first time I realized the splendor of the drink. So even though I’ve never been a regular coffee-drinker, I know the thrill. Here in Samoa, the coffee thrill is rare. Almost all coffee available in the country is of the Instant variety. American drip coffee is difficult to find in many parts of the world, but that tends to be because Europeans drink snobby gourmet espresso; not because of a prevalence of instant coffee. Instant coffee is a strange brew of tea. It is not coffee. In any case, just about any hot drink that is normally served in a ceramic mug is referred to as “tea.” Whether it’s tea, coffee, hot chocolate, or koko Samoa, it’s tea. And more often than not, whatever it is has a lot of sugar in it. In a law class in college, we studied the civil case of the lady who sued McDonald’s after she burned herself on the coffee. McDonald’s did a survey related to the case and found most customers cared more about the temperature of the coffee than the quality of taste. They wanted something hot. In that sense, Samoa seems similar. When workmen came to my house just after I moved in to fix the door screens, the leader asked me for a cup of tea. “I only have coffee,” I said. He shrugged. So I brewed up some Starbucks in my one-cup French press. I had no sugar back then, so I sweetened it with honey. Relating this story to a Samoan friend later in the day, my friend responded, “Those guys don’t care. They just want the drink.” Maybe. Koko Samoa is Samoa’s answer to hot chocolate. It’s hot water poured over crushed cacao beans; it’s a sort of chocolate coffee with no filter to get rid of the grounds. Supy says he likes to chew on the grounds, I’m not a fan of grounds. I keep meaning to try brewing Koko Samoa in the French press. 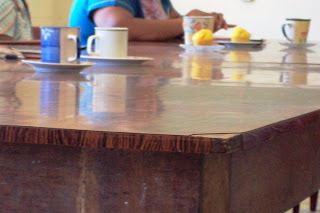 One fantastic form of Samoan tea is laau moli. The name translates to “orange leaf” because water is seeped through citrus leaves. I’ve had it with and without milk, and it’s a delicious concoction either way. The taste is of sweet lemongrass, and it’s always a treat when the student serve that at interval. Mostly though, we get black tea and sugar, which gets the job done just fine. Half the time it’s mixed with instant coffee, which I’ve come to enjoy. It hasn’t warped my senses though: I try and break out the Starbucks on Sunday after church, and it still has its own splendor. I hope you’re well. I think I might go have a cup of coffee right now. Pictures below. At to'ona'i the week before last, we discussed whether coffee goes with the meal or after the meal. I posited that coffee goes really well with taro. A woman countered that by saying she preferred the taro going with the oka, and then pointed out coffee doesn't go well with oka at all. Well played. 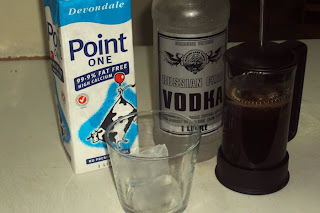 I found out one night recently that you can make a descent White Russian by substituting coffee and sugar in place of Kahlua. Try it. Blast from the past. Ants got into the sugar at a school event in January. 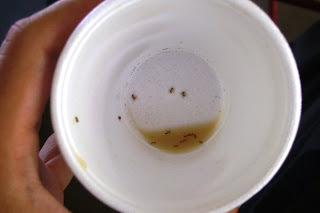 I didn't discover this until I got to the bottom of the cup. Moral of the story: Never get to the bottom of the cup. You're a drunk LOL! I'm not a fan of vodka but I think I'll try that one of these days....when I really need a drink after a long day of work. Yeah, I know, now I sound like a drunk. Thanks for the postings, I'm a huge fan. Hi. Very funny post today. I'm glad I can stop by Starbucks and get my sugar-free hazelnut soy latte. But I'm glad you are there doing what you're doing so I can read your post while I drink it. I look forward to it each day. Like "Anonymous," I'm a huge fan. I will agree that laau moli tea is not just delicious but the fragrance of the leaves makes it even more heady while drinking it. Yes, nods to you on that. My presumption that you are a Bay person into dessert coffee and Starbucks et al; I thought you would say coffee is for after dinner. However, from the pic, it seems that you use kalo and koko as a meal. That works for me too. 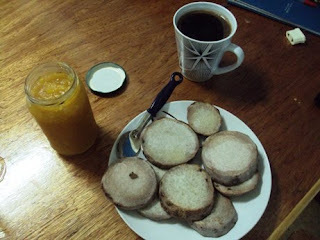 I am not fond of jelly on my kalo, but hey, if it makes you happy, go for it. So question, does that mean that the students make tea and meals for the teachers at your school? There are no lunch ladies? Could you take a pic of the school cafeteria and lunch ladies/staff? What are the kids consuming while staffers are having tea or lunch? And finally, did you know that Starbucks makes a chocolate banana Vivanno? It is a fave of mine, but I think it would be wayyy better if it contained koko Samoa! Check it out on the Starbucks page and I am sure you can refine it for your tastes. i personally enjoy the grounds too, but i find that if you take it out in its hardened form and use a cheese grater, it will get it pretty fine. then instead of being forced to make a giant pot, you can just make one cup by spooning 2 spoonfulls. I thought I was the only person to use the cheese grater method. LOL. The pegu is the best part, awesome with creamy milk. I just had koko alaisa (koko rice) for dessert. you're making me miss home. looking forward to the next cultural exploration. Buy CCK ground coffee from farmer Joe and you will pleasantly surprised by how good it is. It has a smooth creamy taste, perfect for making lates or cuppacinos. I discovered it 5 years ago during a trip to Samoa and have been buying it ever since everytime I go back. So don't deny yourself a decent cup of coffee anymore.